This is awesome addictive game, fun for everyone specially for young ones. 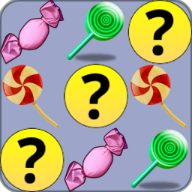 There is not only candy tiles but various tiles to entertain you and improve your memory. There are different difficulty levels as well with sound effects and music.